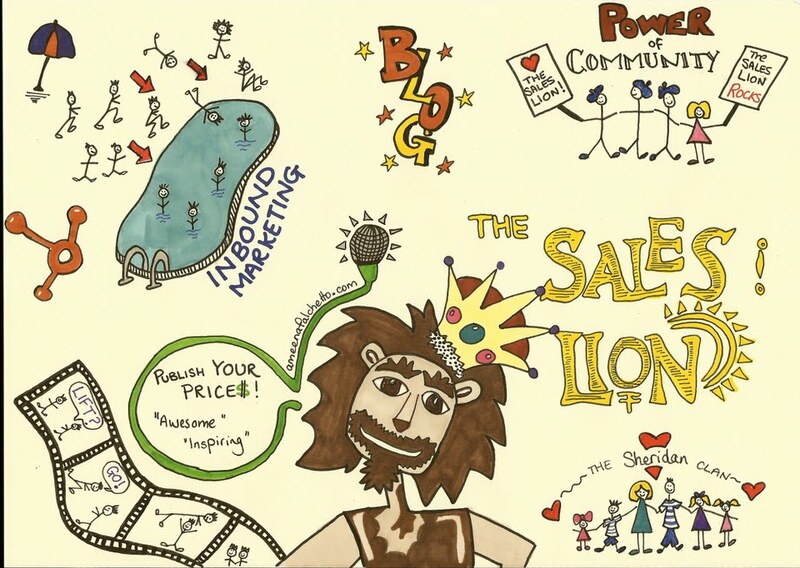 To be a real sales lion, it about being everywhere–as Pat Flynn would say from smartpassiveincome.com, but what the really means is educating clients/customers, and providing world class value. What my defition of “being everywhere” is just content marketing–or it can be call inbound marketing; providing valuable information for free. Information is valuable, research takes time, right answers cost money, and usually bad advice is free. So you if provide good information, and then have more information for money, chances are that will help you look more legitimate, just because you have taken the time to create a “get started” package, and a whole nother package of information. Inbound marketing is also called content marketing. http://en.wikipedia.org/wiki/Inbound_marketing. The term is synonymous with the concept of permission marketing, which is the title of a book by Seth Godin. So okay, what is the difference between inbound and out bound marketing? Sometimes it helps to point out the difference between the two, not just tell you about inbound marketing. Outbound marketing: buying attention, cold-calling, direct paper mail, radio, TV advertisements, sales flyers, spam, telemarketing and traditional advertisingare considered “outbound marketing”. Inbound marketing earns the attention of customers, makes the company easy to be found and draws customers to the website by producing interesting content. Inbound marketing: promoting a company through blogs, podcasts, video, eBooks, enewsletters, whitepapers, SEO, social media marketing, and other forms of content marketing which serve to bring customers in closer to the brand, where they want to be. So when a customer types something into google, BING! You can be there first with the answer for free (free valuable info), then they have a chance to engage your brand and they can see what you have to offer for free,,,,,no telling what you have to offer for money! It must be good! This is where world class content comes into play. If you make a website, you got to focus, and make it good. Imagine what someone would want, if they knew nothing. Content marketing is any marketing format that involves the creation and sharing of media and publishing content in order to acquire customers. This information can be presented in a variety of formats, including news, video, white papers, e-books, infographics, case studies, how-to guides, question and answer articles, photos, etc. Content marketing is focused not on selling, but on communicating with customers and prospects. 1891: August Oetker sold small packages of his Backin baking powder to households with recipes printed on the back. In 1911 he started publishing his very successful cookbook. It went through major updates over past 100 years and is one of the most successful cookbooks globally reaching 19 million printed copies. All recipes originated from the test kitchen of the Oetker company and the book was carefully written as a textbook to teach cooking from scratch. Oetker was very aware of the need for good marketing, practical communication and use of his doctor title to lend authority to his marketing. 1895: John Deere launched the magazine The Furrow, providing information to farmers on how to become more profitable. The magazine, considered the first custom publication, is still in circulation, reaching 1.5 million readers in 40 countries in 12 different languages. 1900: Michelin developed the Michelin Guide, offering drivers information on auto maintenance, accommodations, and other travel tips. 35,000 copies were distributed for free in this first edition. Although Michelin eventually began selling these books, the publication still set a precedent for both informative guides and content marketing distribution. 1904: Jell-O salesmen went door-to-door, distributing their cookbook for free. Touting the dessert as a versatile food, the company saw its sales rise to over $1 million by 1906. The long lost are of creating a sales page or letter. Well there are tons of bad ones out there. and more often than not, they don’t ever make an offer, just forgetting a key aspect, can’t make money if you dont offer or ask for money. If you don’t believe its worth money, then its not; keep working. Sales letters are really all about confidence. You’ve got to get the tone right. If you don’t believe in it, your customers won’t. Sales letters usually have the format.